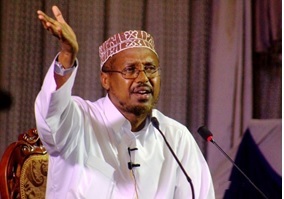 Sheikh Mustafe Haji Ismail Haarun embodies enlightenment and elevation, and his speeches have touched and shaped the lives of millions of people. But who is Sheikh Mustafe? He is a knowledgeable, an inspirational, and a pragmatic Somali intellectual who has devoted his life to spreading Islam and enlightening its adherents. He is an academic with practical knowledge in numerous fields. In addition, he is a spiritual leader, a historian, a researcher, and a physiologist. On top of that, he speaks a number of languages, including Arabic, English, and his Somali mother tongue. Am I exaggerating the Sheikh’s attributes? No, I am not. Sheikh Mustafe espouses the importance of knowledge so that people can lead a worthy living life both on earth and hereafter. On the one hand, he urges his audiences to equip themselves with solid education that can help them succeed and enable them to support themselves and their families. A meaningful education, he points out, is the very foundation for a possible advancement. He especially reaches out to youth and young individuals and urges them to hasten to educational institutions to gain knowledge and graduate with degrees and diplomas. He also admonishes able bodied people to get at work and earn legal provisions. On the other hand, the Sheik underscores the significance of attaining knowledge that helps people understand their creator. When people recognize Allah (God) and worship him, they become content, lead an easy life, and live a meaningful life on earth. Hence, the good Sheikh capitalizes on the relationship between being an obedient servant and having a pleasant life. Indeed, Sheikh Mustafe helps souls elevate to a higher place by inspiring and engaging them in pragmatic discourse. Employing a figurative language, he keeps his audience interested, involved, and educated. And many people cannot for a moment take their eyes off him when he speaks. It is believed that praising someone with envy brings harm. I am not praising the Sheikh with envy but with sincerity and admiration. May Allah protect and bless him. He has been chosen to reach out to those who live on the margin of reality by reminding them of the essence of their very lives. Because life is beguiling, many people cannot map out a clear plan for themselves, making them end up in a deep ditch in the end. To avoid such lethal ends, Sheikh Mustafe advises people to steer clear of any perils that can destroy both their worldly and hereafter lives. For example, the Sheikh tells people to not be beguiled by the vague presence of something: a nice family, a nice house, a nice car, or a bank account full of money. Eventually everything comes to an end. At times, he makes hearts ache and eyes tear up; at other times, he makes faces and hearts smile and lighten up, for his sermons alternate between fear and hope. In fact, a lot of people credit their spiritual wellbeing to the Sheikh. He ushers his audience out into the light. As a member of his audience for many years, I have had my share of his heartfelt lectures. They have shaped my perspectives and exposed me to varied realities of life. I love him for the sake of Allah and wished to have met him, and I eventually met him in mid August 2018, in Hargeisa, Somaliland. I had had him in mind before I left my hometown (Edmonton) for Hargeisa in late July 2018, but did not know whether I could see him. After one week of my stay in the city, I had informed my brother in-law that I needed to see Sheikh Mustafe. “I continually listen to his speeches on Youtube, and they have shaped my life. I really need to see him,” I said to my brother in-law, whose schedule was quite tight. “Sheikh Mustafe has a centre called “Masalla”, but it is a bit distant from here,” my brother in-law said. “Do not worry, I will take you there.” Time was ticking on me as my trip was just a month, and I was fairly anxious to see the Sheikh, just to say Asalamu Alaikum and shake him hand. But my brother in-law’s availability never materialized; my intense yearning to meet the Sheikh never subsided. One morning around 11 o’clock, while seated on a corner near my hotel in downtown Hargeisa, I spotted the Sheikh walking toward an easterly direction. I sprang up, trotted, waved, and yelled “Sheikh Mustafe.” A bit surprised, he stopped and looked at me. I reached him, shook him hand, and briefly introduced myself. “I am from Canada and I listen to your YouTube lectures. May Allah reward you for the good job you are doing for Islam and Muslims,” I said. And I warmly hugged him. He grinned, but did not utter a word. It was the first time I shook him hand or spoke with him. We parted ways and did not know what would be in his mind. As for me, my problem was solved, as I saw the Sheikh I so much needed to meet. Sheikh Mustafe’s speeches are not philosophical but simply hinge on the Quran and the sayings of Prophet Muhammad (peace and blessing be upon him). Sometimes, he brings up dense philosophical questions and dissects them. From the way he compares and contrasts and frames arguments, he is an avid reader of diverse view points. He comes up with tons of discussions and puts them under a Quranic microscope. For him, Quran is the foundation for everything. He makes clear how both Eastern and Western philosophers have viewed the world, and juxtaposes their positions with that of the Quran principles. Sheikh Mustafe, for instance, narrates a case of a renowned French philosopher, who murdered his wife. He slew her, simply because he saw her happy and laughing. A little later, he had called police and told them that he killed his wife. The police hurried to the philosopher’s house and found the dead body of his wife. When asked about the motive, he said,” I saw her happy and wanted her to leave the world in a state of happiness. This life is nothing but a simple joke.” His France nation became dumfounded after hearing the philosopher’s story. Commenting on this incident, Sheikh Mustafe says the philosopher entirely misunderstood the real meaning of life, which is to use it as a vehicle to hereafter life. Yes, life is full of ups and downs and one wrestles with numerous challenges over the course of his or her life, but this worldly life is not where the ultimate joy lies. Sheikh Mustafe Haji Ismail epitomizes sturdy resilience and optimism. He belittles all challenges that one confronts, since all difficulties are resolvable. His thinking is premised on the fact that people can live a good life when they educate themselves and positively contribute to their societies. He also believes that individuals should have a strong relationship with their creator in order to prosper in this life and in the hereafter one. He urges his audience to get dominant credentials, to earn lawful provisions and provide for their families, to enhance their communities, and to strengthen their connection with Allah. His YouTube lectures comprising different topics are impactful and appeal to a multitude of people. Sheikh Mustafe Haji Ismail Haarun is a priceless gift for the Somali people. We pray to Allah to exalt the Sheikh’s time and life.